The Thomasville Kids Southern Dunes Lifestyle 4-in-1 Convertible Crib is like the Cadillac of the convertible cribs. This also may be the only bed your child will ever need from infancy all the away to college. It is beautifully designed and will probably become the focal point of your nursery. This crib has fixed sides for added safety, and also a height-adjustable steel mattress spring. The spring will become more important as your child grows. This crib converts from a crib, to a toddler bed (optional Storkcraft Toddler Guardrail is sold separately), to a daybed, and then to a full-sized bed. This is a big and sturdy crib weighing in at 80 pounds. 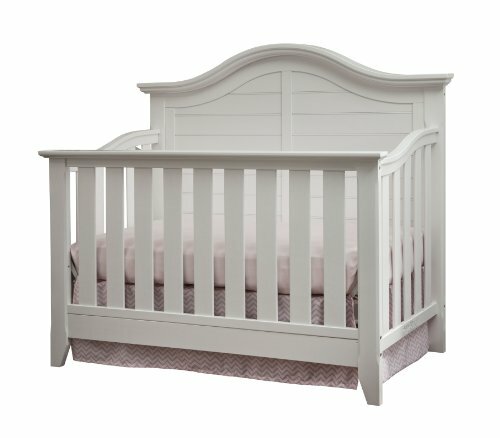 This crib is available in non-toxic finish. It is designed to be paired with the Thomasville Kids Southern Dunes Changing Table. If you like matching sets of furniture, then you may like that you can match this with the changing table. This crib is JPMA certified and is also compliant with all CPSC and ASTM safety standards. The crib is 52.8 inches from the tallest point. This is a really nice crib! It is not going to be an economy crib as far as the price. If you can swing this extra money, I think your chances of being very satisfied are high. Parents who purchased the Thomasville Kids Southern Dunes Lifestyle 4-in-1 Convertible Crib, overall were very pleased. Let's take a look in detail of some aspects of this crib and what parents who purchased it had to say. If you've ever bought something and then spent all day trying to figure out the directions and put it together, you know how frustrating that can be. Or you buy something and then need certain tools that you don't have in order to assemble it. Thankfully, the Thomasville Kids Southern Dunes Lifestyle 4-in-1 Convertible Crib goes together fairly easy, and they even provide an Allen wrench. One mother who put this crib together herself commented, "Easily assembled. Put this together by myself while my husband was at work. Only took me an hour maybe." Another mom said, "Gorgeous, high quality crib! Very easy to put together. I did it by myself at 7 months pregnant. Looks very beautiful!" This crib seems like it should be a breeze to put together. And believe me, this is not the case with all of the cribs on the market. "This crib was above and beyond my expectations. Opening this was like Christmas! This crib is beautiful and very stable when assembled. We were going for a cowboy theme in our nursery, and the finish was perfect for that. This feels like a quality piece of furniture that will grow with my little one for quite some time." The Thomasville Kids Southern Dunes Lifestyle 4-in-1 Convertible Crib is not cheap. But keep in mind that you are getting a crib, toddler bed, daybed, and also adult bed all in one (conversion kits sold separately). Also, you will be getting a quality piece of furniture that should last your child for many years. Overall, parents who purchased this crib were very happy paying the extra money. Most felt that it was worth every penny. This is a stable, safe, and durable crib. It's nice to know when you pay more for something, that it truly is a better product. This seems to be the case with the Thomasville Kids Southern Dunes Lifestyle 4-in-1 Convertible Crib. Some of the economy cribs that I reviewed were cheaply made, but not this one. If you can swing the extra money, I don't think you will go wrong with this crib purchase. The fact that it converts to a toddler bed, daybed, and then an adult bed is a bonus. Just as a crib alone this is a beautiful, sturdy, and functional piece of furniture. I can't see one negative attribute to this crib. Even right down to the small details like putting it together, this crib scores high. I highly recommend giving this crib a chance. I do not think you will be disappointed. I hope that my review of the Thomasville Kids Southern Dunes Lifestyle 4-in-1 Convertible Crib helps you decide if this baby crib is right for your family.